Hey, and welcome to day five of CS First Fashion and Design. Today, you'll create a fashion poll to find out people's personal tastes and opinions. To do this, you'll learn about an important computer science concept; variables. 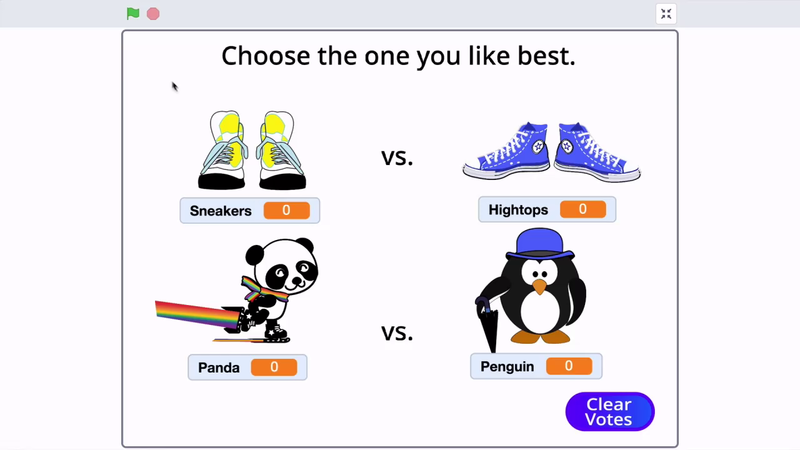 This poll discovers if the user prefers yellow or blue sneakers, and whether they prefer pandas or penguins. The person who takes the poll can vote for a sprite by clicking on it. A variable is a way to store values. In this program each vote is stored in a variable. It's important for fashion designers to understand the opinions of people who will buy their designs. Months pass between a designers initial idea, production, and selling the product in stores. A fashion designer needs to find out the tastes and opinions of potential buyers ahead of time so they'll make something that people will want to buy. Fashion designers, as well as people in other fields find out this information through market research. Through market research, you can find out who your potential customers are, what they want to buy, and how much they're willing to pay for it. Market research helps insure that customers love what you create so your fashion business can be a success. After you finish watching this video click the Fashion Poll Starter Project link to open the starter project in a new tab. Sign in to Scratch, and click the Remix button to save this project to your account. Then return to this tab and click the arrow to move on to the next video. Click the Fashion Poll Starter Project link. Click the Remix button, and click the green next arrow to watch the next video.